Besides being gluten-intolerant, my husband is sensitive to lactose, too. He can have cheese and butter but needs to take pills to totally enjoy them. He also likes to have some snacks on hand when he braves the Los Angeles traffic coming home as his hunger pangs tell him that traffic is putting his evening meal way off schedule AGAIN! Most cracker recipes have butter or wheat in them. It took me awhile to come up with something that would stay the onset of starvation on the long drive home but wouldn’t incite digestive problems. I finally came up with the following recipe which has protein, fiber, vitamins, no baking powder, and the right kinds of fat. Combine the coconut oil (or ghee) with the juice and the eggs and mix well. Combine the wet ingredients with the dry ingredients and gently mix until a workable dough forms. The weather seems to play a huge part so, if necessary, add bits of water or juice along with teaspoons of ghee or coconut oil until the right consistency is reached. To save time and mess, divide the dough into fourths. 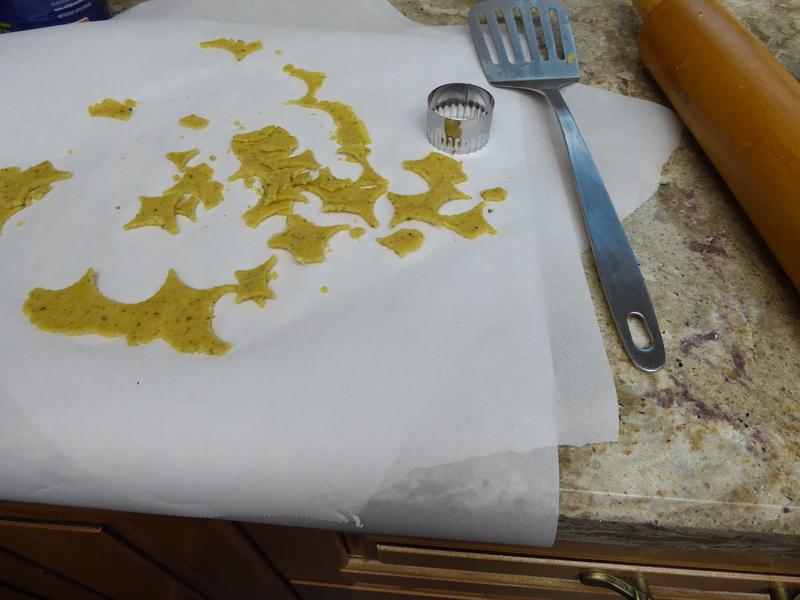 Roll out one fourth between two sheets of parchment paper until about an 1/8th inch thick. 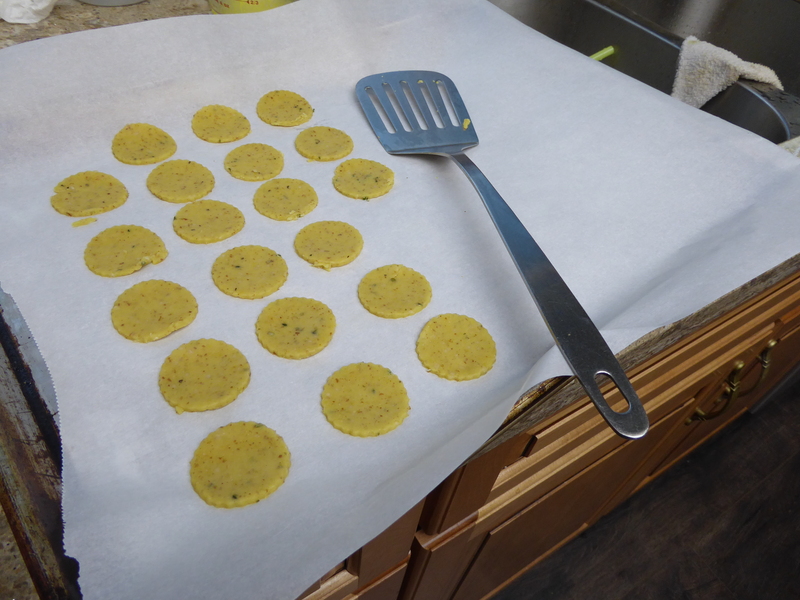 Using a small round cookie cutter, cut out the crackers and place them on a parchment-lined baking sheet about a quarter of an inch apart. Bake for approximately 10-15 minutes or until golden. Remove to a cooling rack, wait a few minutes, and try one! Store in a tightly lidded container. I usually divide the cooled crackers into three or four containers: One for easy snacking and the other ones in the freezer to keep fresh. *Ghee is merely the solids removed from butter. I make mine my putting two sticks of butter in a large, glass measuring cup and gently melting them in the microwave. Once the butter is completely melted, let set until it separates and then carefully pour off the clear part into a small container being careful to avoid getting any of the cloudy residue into it. *Hemp Hearts are at Costco and they have the best price I have found. They have a mild, nutty flavor. Although we always called this a holiday cheesecake, I think it appeared many times at dessert time on ordinary days of the week. Naturally, any time cheesecake showed up after dinner, could be declared a holiday! Place softened cream cheese in a large mixing bowl. using an electric mixer, beat at medium speed until cream cheese is thoroughly creamed. Add eggs, one at a time, beating until each is well combined. Add vanilla. While running the mixer gradually add sugar, beating well. Mixture should be thick and smooth. Carefully spoon mixture into crust. smoothing evenly. Bake in preheated 350 degree oven for approximately 50 minutes. Top will brown and crack. Cool and refrigerate eight hours or overnight before serving. You can strike a festive note by spooning a puree of strawberries over each serving and garnishing with a mint sprig. Crushed pineapple also compliments cheesecake. Prepare about an hour ahead, a cup and a half of crushed pineapple combined with the zest of a lemon. Spoon over individual slices just before serving. *A spring form pan is pictured above. Walmart usually sells them, three to a set for a budget-friendly price considering how often you will be baking cheesecake now! Yes, there are some times that you actually need to have a cake ready within hours for unexpected company, a birthday cake, a gift for a friend, etc. Unfortunately, we find the rest of the day crowding in on us and have no idea what to do except head over to the store bakery for something that will taste and look store bought! This has been a favorite recipe in my family for years. My mother came across it over 40 years ago and it has saved the day many events since. I like the fact that it is open to interpretation in that you can use whatever flavor cake or pudding mix you like for the perfect end result. Don’t care for the sherry, use water or juice. Don’t have a bundt pan? Make cupcakes or use a loaf pan. Combine all ingredients and mix just until well incorporated. Smooth into a well-greased and floured bundt or tube cake pan. Bake at 350 degrees approximately 35-40 minutes. Cool ten minutes in pan and invert onto serving plate. Dust with powdered sugar. Add ½ cup ground walnuts or pecans to the cake batter before baking. Add 3/4 cup toasted coconut to the cake batter before baking.